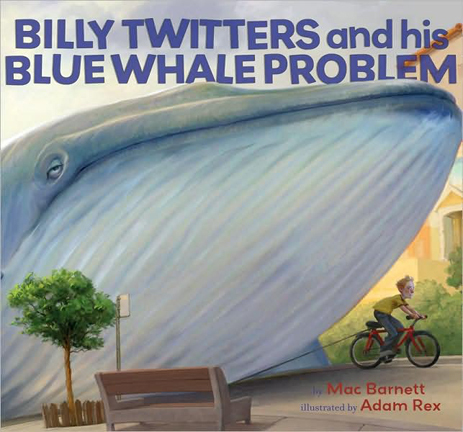 Billy Twitters and His Blue Whale Problem by Mac Barnett. Illustrated by Adam Rex. You know what is annoying? When parents make all kinds of unreasonable demands on their children. And what’s even worse than that? When they go making completely unbelievable threats like, “Do your homework or I’m sending you to the moon.” Or, “Don’t make faces or one day that face will stick.” In Twitters family, it’s always, “Billy, take out the trash or we’re buying you a blue whale.” Or, “Billy, eat your vegetables or we’re buying you a blue whale.” Which is of course a RIDICULOUS threat because nobody in his right mind is going to burden a kid with a real live, full-grown blue whale! So, maybe Billy’s parent’s are in their right minds because what do you think Billy saw staring through his window one morning? That’s right: the giant eye of a blue whale. Not only that, but Billy couldn’t leave the whale at home; it’s his responsibility. And to make matters worse, his teacher was so excited by the whale’s presence he decided to devote the class to a study on cetology, when they were SUPPOSED to watch a movie in class. It wasn’t Billy’s fault, but the kids all blamed him. It’s fun. It’s silly. It’s totally worth a read. 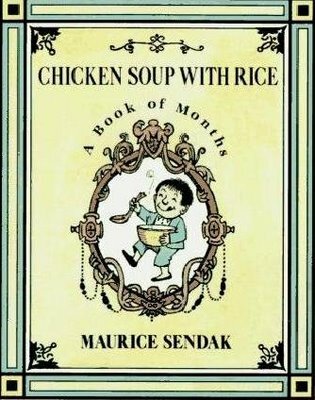 I had a little blast from the past this morning when my son was given a little box set of Maurice Sendak books, including “Chicken Soup With Rice” and “Alligators All Around”. I had the same box set as a child as well at the Really Rosie record, in which Carole King sang versions of the books. Thanks to the magic of Spotify, I can revisit the musical versions of these songs. For me I cannot disassociate “Chicken Soup With Rice” from Carole King’s musical interpretation. But my demanding son was very disapproving of me every time I drifted into singing the words. “Pierre” is fun to read; it’s a cautionary tale about a boy who only says “I don’t care”. So, he gets eaten by a lion. It’s also fun because every other line (practically) is “I don’t care” so I just have my son say that line over and over and over. I just hope it doesn’t carry over into real life as well. Hello, dear readers!! Though normally I find the idea of exposing the private thoughts of youngsters as a grievous act, I can’t help but share this wonderful window into the mind of my oldest niece (and future Julia Child), Shelly Swallowsbeigh. Here Shelly tells you all (and her Diary!) 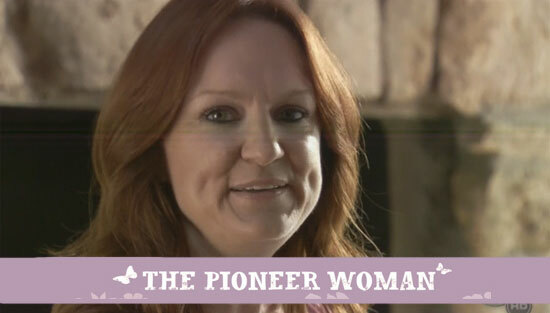 about the amazing culinary journey she is embarking on—all thanks to the Food Network’s show “The Pioneer Woman.” Enjoy! Today I just made the most A-M-A-Z-I-N-G decision of my life. Seriously, this is even better than when I mailed in that certificate for a free Magic Bullet cause I won the cake-walk at my school’s carnival back in November. Sure, I know I’ll basically be able to say on talk shows or Top Chef or whatever other cooking show I get on (when I become a big food star! It’s gonna happen!) that winning that was the start of my culinary career, but, seriously, not even the Magic Bullet is as cool as this! I’m going to be on “The Pioneer Woman! !” Eeeeeeeeeep! Now, I know what you’re saying, diary. The Pioneer who? But what you don’t know is that “The Pioneer Woman” is this really cool lady named Ree Drummond and she’s a cook—just like me!! Not only that, but she lives on a horse ranch in Oklahoma and is married to this really cute cowboy and has these super-adorable kids and gets to cook for them all day and she has a blog and a show on the Food Network and all of what I just wrote is only, like, THE DREAM I’VE HAD ALL MY LIFE! And now I, Shelly Swallowsbeigh, am going to be on her show, so my dream is coming true! Yay for me! BTW – Here’s a link to a really good example of what Ree does best: down-home cooking. I have used this recipe called “The Bread,” like, so many times and it always is soooooo good. She’s totally an Einstein! So, you might be wondering how I am getting to go on her show, huh? Well, I was down at Williams Sonoma perusing (I just learned that word, btw, and I LOVE it! Cool, huh?) the blenders cause you know I love a good smoothie when all of a sudden I saw this big line that was forming in the back of the store. All these people were standing there and they were all holding books, but I couldn’t tell what they were reading. Then, I saw her! Oh my gosh, she is so pretty. She was smiling at people and talking to them and signing their books (they were her new cookbook! Um, please, Santa?) and I could tell that she is, y’know, really down to earth and loves doing what she does. Shows ya there really are angels here on earth, right Diary? Anyway, of course I waited in line too even though I didn’t have a book. I mean, duh! ARE YOU KIDDING ME?? AWESOME!! So, then one of the people she is with comes up to me and asks if I ever would have any interest in being on her show and if my Mom and Dad are with me. I tell him they aren’t, but give him my Mom’s number and the next thing you know I’m being flown out to Oklahoma next week to show Ree (and the world) how you can make “The Bread” into an international affair by adding things like parsley or oregano to it. Anyway, diary, I know this is all totally stream-of-consciousness but I had to tell somebody what’s happening!! I mean, I can’t believe that me thinking about how good a Jamba Juice sounded when I was at the mall (that’s what led me into Williams Sonoma) could be so life-changing. The Pioneer Woman is only, like, my favorite show on the Food Network and now I’m going to be on it! Hold your horses for me, Ree; I’m on my way ! One thing you’re unlikely to hear someone complaining about is getting too much sleep. In fact, most of us long for sleeping in on the weekends or catching up on some much needed sleep that work, family, and other responsibilities deprive us of. However, sleeping too much or oversleeping can be just as unhealthy as not sleeping enough. 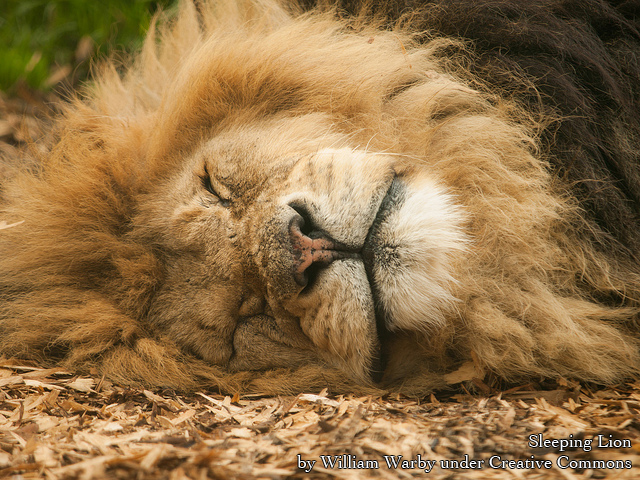 The trick to sleep, like many things in life, is balance. Everyone needs a different amount of sleep, just like different cars need a different amount of gasoline to travel the same distance. The general rule is that you should try to get around eight hours of sleep per day, and most people will fall within one hour of this requirement. Your actual need for sleep depends on the amount of stress your experiencing and how physically active you are, to name a few. If you don’t sleep enough, you accumulate a sleep debt; however if you sleep too much you don’t necessarily accumulate a sleep credit. Oversleeping, also called hypersomnia, is a serious medical disorder. Symptoms associated with hypersomnia include anxiety, low energy, mental problems, and a constant need for more sleep. Hypersomnia has also been linked to increased risk for diabetes, obesity, headaches, back pain, depression, heart disease, and even death. If you’d like to read more about how hypersomnia increases your health risks, check out this article on oversleeping by WebMD. The good news is that hypersomnia is a very fixable problem. Sometimes, hypersomnia is brought on by underlying medical conditions, which you’d need to see a doctor for; however, it’s more common that hypersomnia is simply a result of poor sleep hygiene. Below is a list of tips and suggestions to help you regain control over your sleep habits. 1. Establish a regular sleep routine. Humans are creatures of habits, and if you can discipline yourself to go to bed and wake up at the same time every day, getting the right amount of sleep will be easier. It takes about 30 days of doing something or not doing something before it becomes a habit, so it’s important to stick with your sleep routine for at least one month. 2. Plan your day. If you have a plan of attack going into each day, you’ll know exactly how much time you need to get everything done. Having a plan can help you realize that oversleeping is depriving you of doing the things you want during the day. 3. Optimize your wake up routine. It’s important to look forward to getting out of bed in the morning. Since the morning commute likely isn’t a big motivator, think about all the things you love doing before you officially start your day. Set aside some time in the morning especially for yourself. 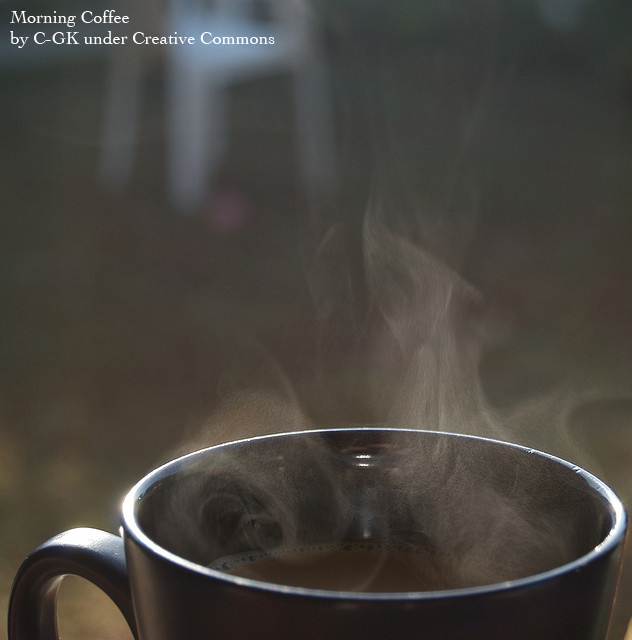 Do you love a fresh, hot cup of coffee in the morning? Do you like to read the newspaper before getting your day started? Maybe you like to take a hot shower with an invigorating body wash. Whatever it is, figure out what makes you happiest in the morning and you may actually look forward to getting out of bed. 4. Avoid alcohol and caffeine before you go to bed. Stimulants and depressants can affect your body’s ability to get a good night’s sleep. If you want to drink something to help you sleep, try a warm glass of milk before bed. 5. Exercise regularly. Exercise is linked to a number of health benefits, including better sleep. Going for a jog, participating in a yoga class, or lifting weights at the gym helps cleanse your body of impurities that build up throughout the day. Exercise also drains any extra energy you may have left over from the day, which can help you fall asleep faster. The above suggestions are just a couple ways to help you improve your sleep hygiene. If you find that you cannot break yourself of oversleeping, you may also want to consider making an appointment with your doctor. Do you sleep too much, or not enough? Do you have any morning rituals you can’t live without? Let us know in the comments below. My husband and I are back from our extended Caribbean stay – back home (good) and back to the cold (not so much). Wintry weather calls for homey comfort food, so when Kevin requested chili for dinner, I was quick to comply. In my world, a bowl of mouth-burning, spicy chili is not complete without a fresh-from-the-oven batch of buttery corn bread. It’s so easy to make your own, with multitudes of personalization options. Sometimes I make it unsweetened, or zest it up and make Lime-Cilantro Corn Bread with Honey Butter. This time, though, I just made straight up old-fashioned corn bread – the perfect foil for our fiery stew. In the morning, I decided to use some of the corn bread for our morning meal. But what? Then it came to me: a play on Hot Browns, the legendary late-night breakfast dish from The Brown Hotel in Louisville, Kentucky. I switched it up a little, omitting the turkey and using Irish bacon. Just wait for that hot, bubbly, bacony dish to come out of the oven. 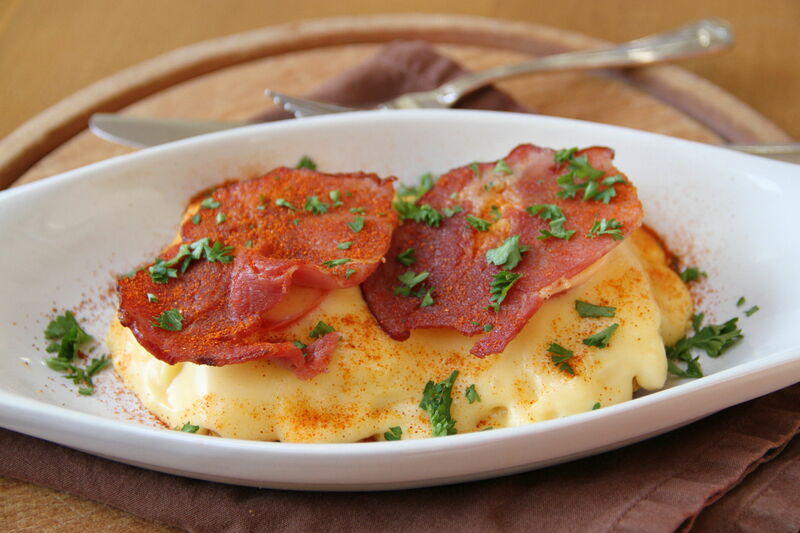 Just wait for a legendary Hot Brown breakfast in bed. 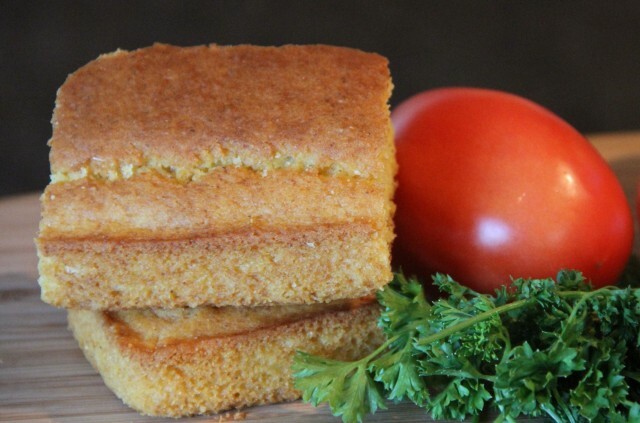 Slice corn bread pieces in half, and place two each into two oven-proof dishes. Cut Roma tomato into four thick slices, and place one tomato slice on top of each piece of corn bread. In the meantime, fry bacon over medium low heat to a crispy brown. Drain on paper towels. Set aside and keep warm. 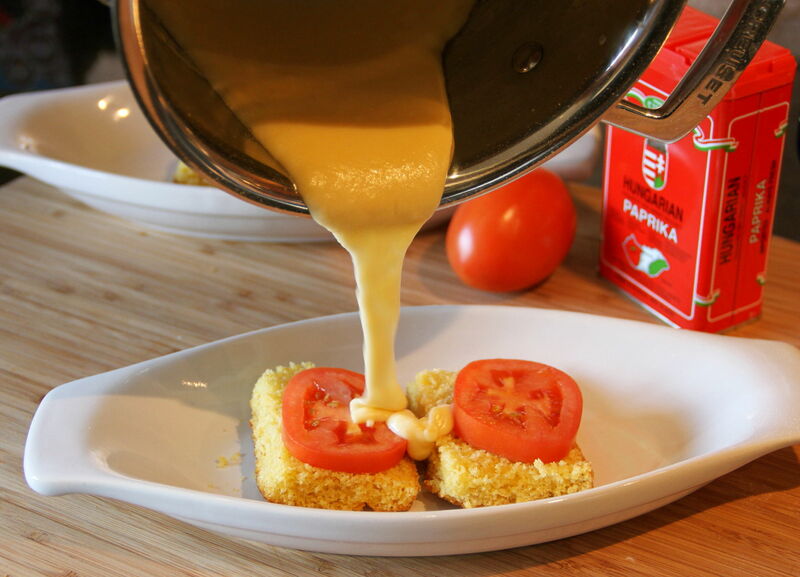 To make cheese sauce, melt butter in small heavy saucepan over medium heat. Whisk in flour until smooth, thick paste forms. Whisk in milk and cook until slightly thickened, 3 to 4 minutes, stirring constantly. Add grated cheese and stir until just melted. Pour half of the cheese mixture over each dish of corn bread, covering bread and tomatoes completely. 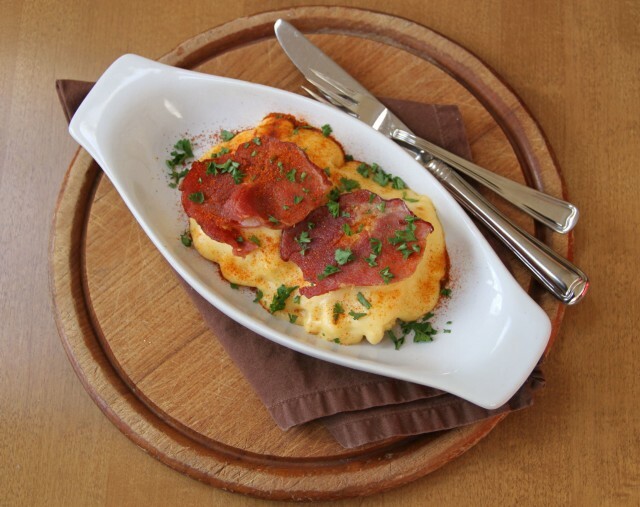 Broil Hot Browns 6 inches from heat, until cheese sauce is bubbly and lightly browned on top, about 1 minute. Top each dish with a slice or two of crispy Irish bacon, sprinkle with paprika, garnish with fresh parsley and serve immediately.